How can removing the obstacle of bail help address inequality in the criminal justice system? In New York, 80 percent of misdemeanor defendants can’t afford to pay bail of $1,000 or less. While the bail system is intended to make sure that people to return to court, the practice unfairly punishes marginalized people by forcing a difficult choice: either they wait in jail for a trial (often losing their jobs in the process) or plead guilty and accept a criminal record just to go home. While advocates push for much-needed structural bail reform, Reboot partnered with the Brooklyn Community Bail Fund to redesign the bail experience for those who need it most. Bail is a major driver of inequality in the United States court system. To help address this obstacle for the innocent poor in New York, Reboot partnered with the Brooklyn Community Bail Fund (BCBF) to develop a system for selecting defendants to be released on bail, posted by a revolving fund. In addition to collaboratively developing the eligibility criteria for defendants, we created communications materials to help ensure BCBF-funded clients return to court and defend their cases. In the first weeks of launching, 98 percent of BCBF clients returned to court as planned. For misdemeanor cases in New York, 99.6 percent of convictions come from guilty pleas. The primary strategy that prosecutors use for encouraging guilty pleas is the threat of bail, which a majority of defendants can’t afford. Rather than wait in jail for a trial, people often plead guilty just to go home, to care for a child or to avoid losing a job; many are innocent, or have been stopped and searched unlawfully. In short, bail denies too many citizens the basic right to have their cases tried in court. Frustrated by this issue, a group of public defenders in Brooklyn established the Brooklyn Community Bail Fund (BCBF), a rotating fund that would post bail on people’s behalf. By giving poor defendants a chance to fight low-level criminal charges, the fund would keep Brooklyn families together, productive, and stable. Their first priority was to develop a client screening process that would ensure fund participants were not a threat to the community and likely to return to court. Reboot partnered with BCBF to help establish a sound and fair process rooted in the motivations and realities of both clients and court actors like judges, defenders, and prosecutors. 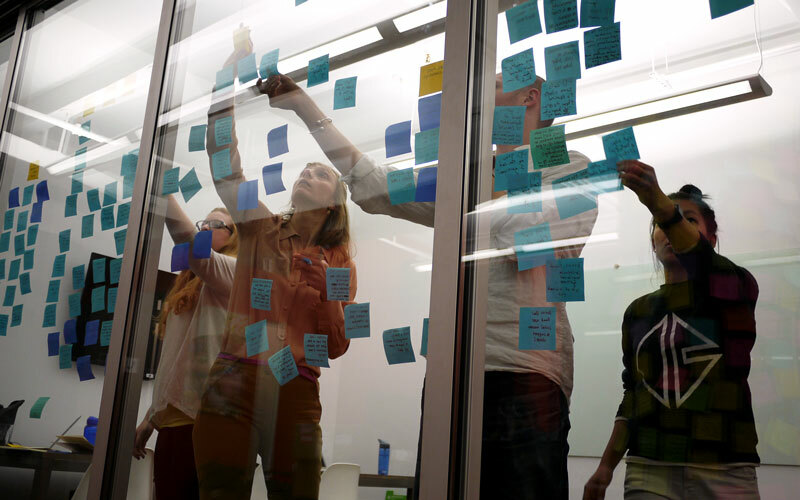 Reboot’s design research approach included ethnographic observation of court practices and in-depth interviews with attorneys and others, and drew from a foundation of background research on legal systems and other bail funds. We used design research to understand the needs, motivations, behaviors, and constraints of people in this particular court system, including clients, judges, prosecutors, public defenders, and the BCBF administration. Our methods emphasized immersive observation (including of routine court activity) and semi-structured one-on-one interviews. The knowledge gained from design research helped us develop realistic and meaningful designs to support the bail fund administration. These designs were informed by community needs and context as well as the cultural and psychological factors which shape them. Reboot facilitated a workshop with BCBF in which we co-created a set of criteria for evaluating potential bail fund clients. The criteria assess both the likelihood that a defendant will return to court, as well as the consequences to job, family, and other responsibilities if he or she is unable to post bail. In collaborative sessions, we analyzed the rationale behind these selection priorities, along with the barriers and entry points facing people in the potential bail fund process, and made recommendations for the fund’s administration. Using insights from the research and collaborative design sessions, we crafted a strategic communications plan for BCBF administrators to introduce clients of public defenders to the bail fund. We also identified a key problem in the arraignment process, which suggested an unexpected and deceptively simple graphic design solution. The “yellow card,” one of the most important pieces of paper a defendant receives during arraignment, is busy, confusing and easy to misplace. 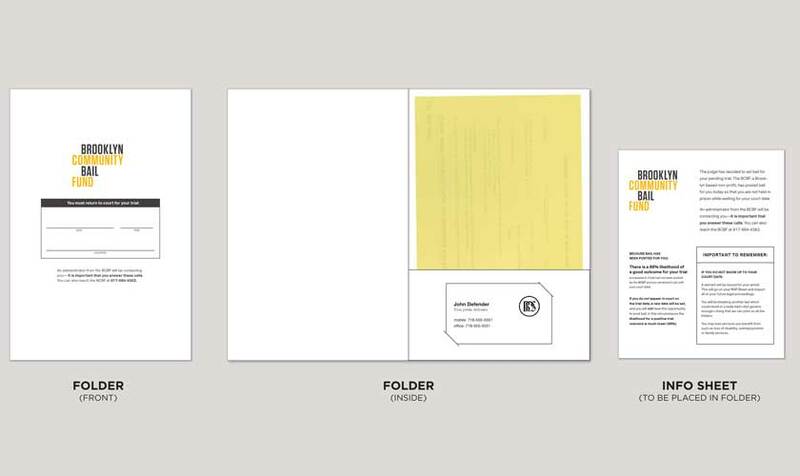 We designed and produced a low-cost fix—a two-pocket cardboard stock folder—meant to hold the yellow card, but also provide a place to call out the most important information from the card—the date, time, and location of the upcoming court appearance. The folder communicates the investment BCBF has made in each client, encouraging him or her to return to court. BCBF has since raised awareness for the cause, including a segment on John Oliver’s This Week Tonight and a widely read article on Huffington Post, and has crowd-funded more than $300,000 for the rotating bail fund.